My photo tank is low, and in lieu of my impending Coynezaa trip to Hawaii, I’ll save the wildlife photos and show you instead last night’s dinner. In fact, today’s posting are not going to be serious, as I have other intellectual tasks and only limited brainpower. My departmental friend and colleague Manyuan Long was born and raised in Chengdu, China. And Chengdu is the capital of Szechuan province, which happens to be the best area for eating in China (I visited there a while back and ate like an king emperor). I’m always bugging Manyuan to tell me what Chicago restaurants he likes, but he’s very picky. For a while he’s told me about Chengdu Impression, a newish restaurant that’s not in Chinatown but on the north side near Lincoln Park. Manyuan claimed that he liked the place a lot and that the food was authentic. That was enough for me, and I’ve been bugging Manyuan for months to tell more about the place. Luckily, he invited me there for dinner last night, and we had a multi-course Chinese feast. Normally for two people you’d get maybe two dishes and a starter, but we had five dishes and a starter (needless to say, we brought home the copious leftovers). The food was terrific and here’s what we ate. Starter (my single choice; Manyuan ordered the rest): Szechuan cold noodles. 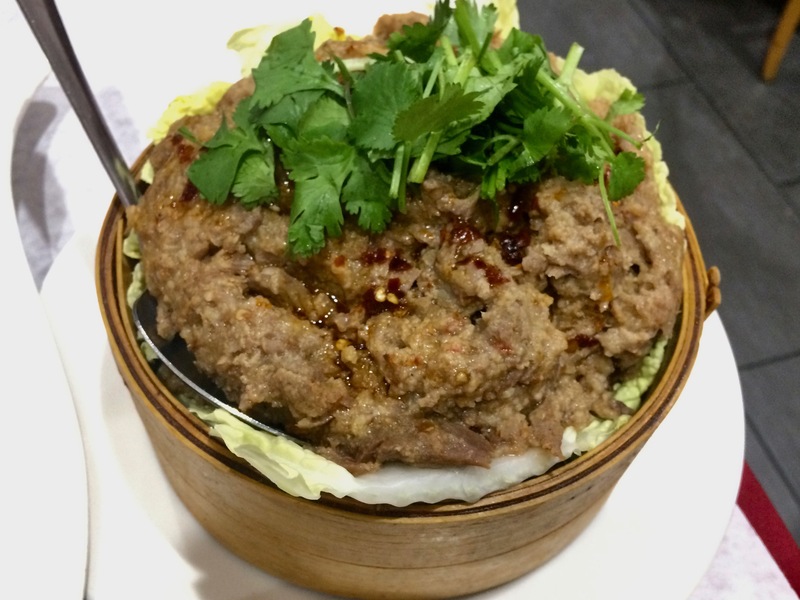 These were fantastic—and a good way to judge a Szechuan restaurant. They were bathed in hot chili oil and sesame oil. (Photos not that great because I used my iPhone, having forgotten my camera.) 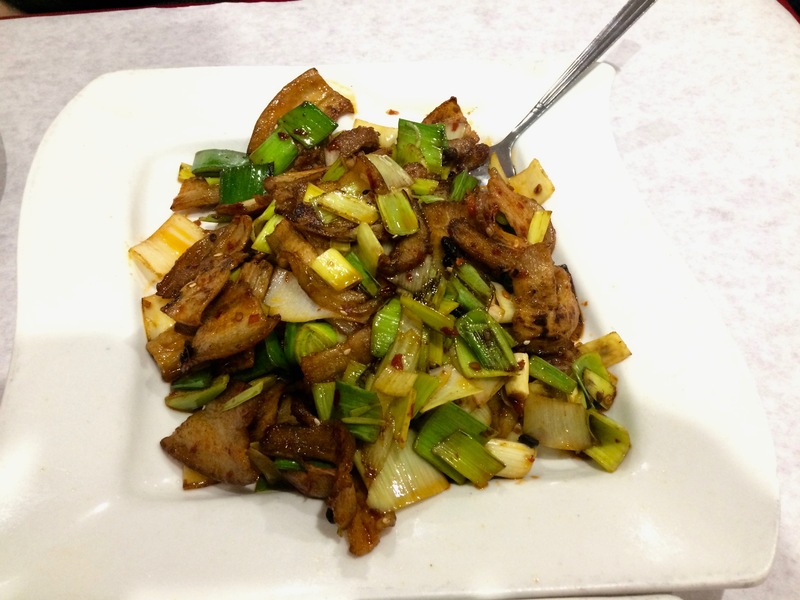 This is an appetizer you must always have in a Szechuan restaurant. And the dishes. 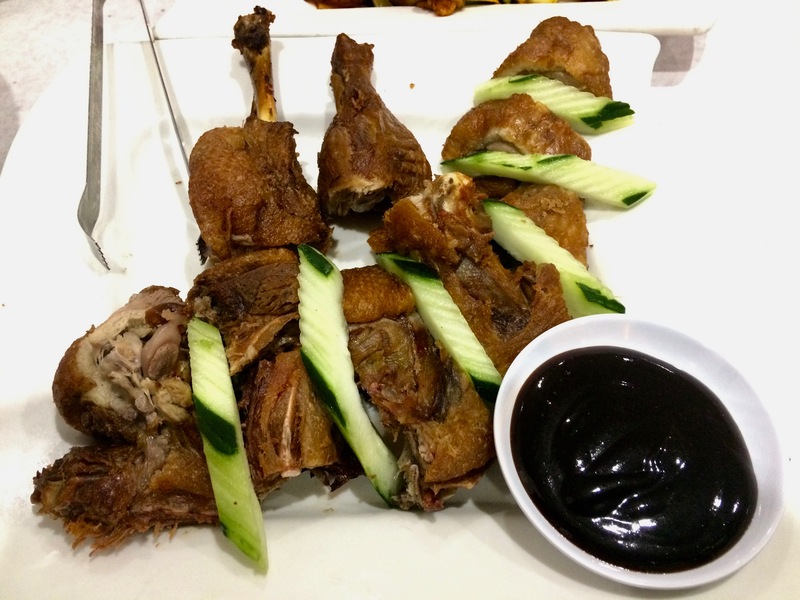 Smoked tea duck (yes, smoked over tea leaves) served with cucumber slices and hoisin sauce. The meat was crunchy and smoky from the tea leaves; yum! 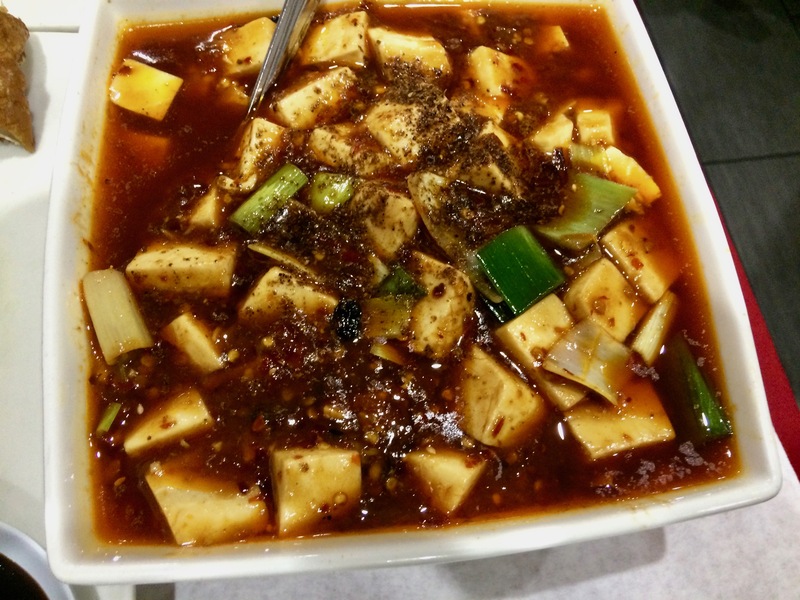 Mapo dofu, tofu served in an incendiary hot sauce with Szechuan peppercorns. This was so hot that even Manyuan had trouble with it. We were going to have dessert, but Manyuan forgot, and, full as a tick, I didn’t need it. And now I have lots of leftovers. This entry was written by whyevolutionistrue and posted on December 20, 2018 at 7:45 am and filed under food. Bookmark the permalink. Follow any comments here with the RSS feed for this post. Both comments and trackbacks are currently closed. I hope Honey doesn’t read this. I was thinking about somewhere to eat on the way to the theater next week, and Lincoln Park is geographically about right – if I can find somewhere to leave the car. Thanks. There’s a free parking lot just north of the restaurant, but it was full last night. It was easy to find street parking; just turn right after the restaurant and then right at the first street after that. They usually aren’t actually cold, just not hot. Perhaps “room-temperature noodles” didn’t sound right. Koreans do eat cold noodles that are actually in an icy broth. It’s good on a hot day. And the Japanese too. I think they’re called soba? Yes, but the way soba is usually served it isn’t truly cold but room-temperature. I’m not saying they don’t have a truly cold version but I’ve never had it. Wikipedia says soba noodles are served “chilled” but I suspect they mean they have cold water run over them immediately after they have been cooked. That’s how I’ve seen Japanese chefs prepare them anyway. The Korean cold noodles are actually a refrigerated or iced soup and much colder. There’s lots of other Chinese food. Guangdong cuisine is not spicy. At least I can’t think of any at the moment. Got to visit Chengdu a few years ago. But, in spite of many of us in the tour group begging our guide to tell the kitchen that we really, really wanted our food hot/spicy we only got dishes that were slightly medium hot at best and mostly mild. We have a Chengdu Impression in the Los Angeles area (Arcadia to be precise). I’m not sure it is related to the Chicago one though. However, it is highly rated by local critics. I plan to try it someday. 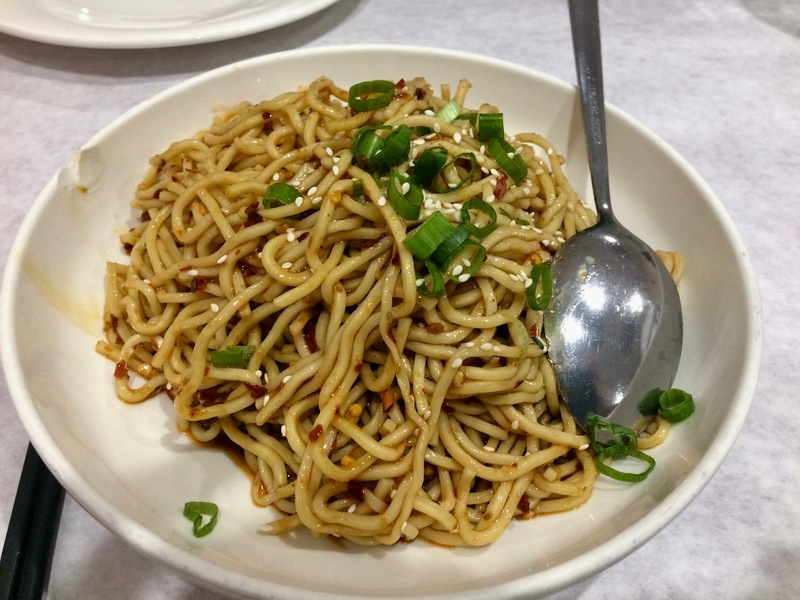 I am with you on the Szechuan cold noodles. That is a dish I seek often. Yours looks very good. Twice-cooked pork is one of my favorites as well. The rest looks really good too. Perhaps I’ll seek out some Chinese food for lunch but I would be setting myself up for disappointment after seeing your feast. 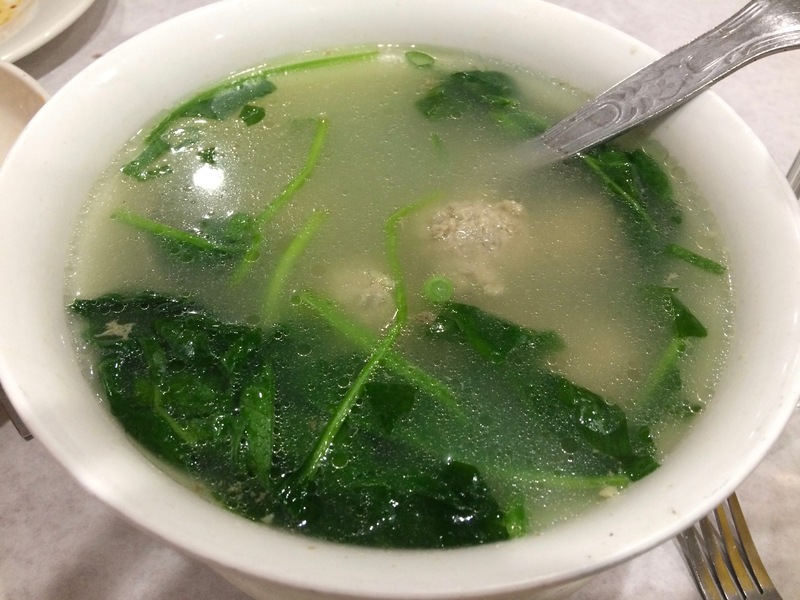 We have good Chinese food in the LA area, of course, but too far to go just for lunch. I’m putting that in my list. Rice stovies! If it’s good enough for Eastern Scotland, it’s probably good enough for the mysterious Orient too. Needs a slice of beetroot though!